With over 14 million users on Instagram, the United Kingdom has some of the most avid users of the 400 million users booming network. With its innumerable historical and contemporary landmarks, the UK has plenty to offer when it comes to snapping pictures! 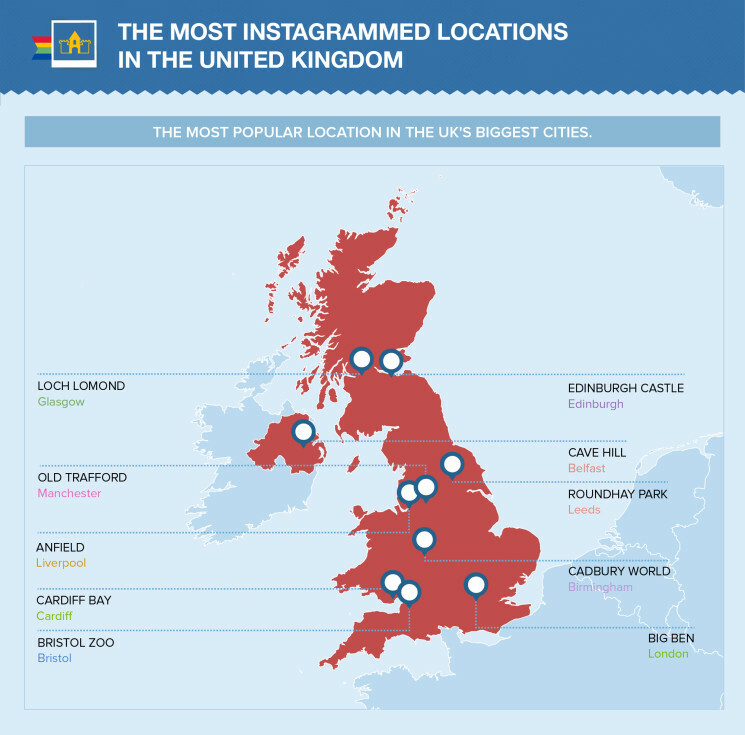 But what are the most Instagrammed locations in the UK’s ten biggest cities? After our successful studies of North America, France, Spain, Italy & Germany, we turned our attention to Great Britain and Northern Ireland. While Americans post a lot of shots of sports stadiums to Instagram, British and Northern Irish Instagram users appear to mix it up a bit more. A handful of iconic football stadiums occupy the top spots in their respective cities and there are a few surprises for the smaller cities of the UK where parks, beaches and shopping malls nabbed the top spots or came in a close second or third. The most instagrammed location in London, and in the the UK, Big Ben, blew the competition away. Sure, tourists snapping shots outside Big Ben and the Houses of Parliament is part of every day life in the Big Smoke, but from what we can see on Instagram, Londoners aren’t shy of snapping the odd selfie in front of the iconic clock tower. Go on now, admit it: you’ve done it too, right? Notable mentions go to Hyde Park and Tower Bridge which came in second and third place respectively. Birmingham’s largest visitor attraction, Cadbury World, got the top spot on our list as the city’s most instagrammed location. With half a million visitors each year, Cadbury World is one of the most important attractions in the UK. And from the photos we’ve seen, it sure seems as though Brummies love them some chocolate! In second and third place came Selfridges and the Library of Birmingham. In Manchester, Old Trafford annihilated the competition and took the top spot as the most instagrammed location in Manchester. The Theatre of Dreams came in first ahead of the Trafford Centre, the indoor shopping centre, and beautiful 600 acre Heaton Park which came in second and third places respectively. Rival stadium, the Etihad Stadium, came in fourth place. It was a tight race in Leeds, but Roundhay Park came out on top. With 1m visitors each year, the 700 acre park which is the home of Tropical World, a series of glasshouses that host among others a famous butterfly house and a number of aquariums, is one of Europe’s biggest parks and one of the UK’s most important attractions. Not far behind Roundhay Park came Elland Road stadium and the First Direct Arena in second and third place respectively. Glasgow, the Shipbuilding capital of the world, has no shortage of landmarks. But it’s Loch Lomond, Scotland’s largest loch, on the outskirts of the city, that took the top spot as the most instagrammed location in Glasgow. The loch, made famous in The Bonnie Banks o’ Loch Lomond, largely beat relatively distant second and third place George Square and the 60,000 seater Celtic Park stadium. Anfield football stadium took the top spot on our list of most instagrammed locations in Liverpool. The 45,000 capacity stadium and home of Liverpool FC obliterated the historic Albert Dock waterfront and 235 acre Sefton Park into second and third places respectively. With over half a million visitors in 2014, the Bristol Zoo was the most instagrammed location in Bristol. The 12 acres of award-winning gardens host over 400 species of exotic and endangered animals from all over the world. Worthy of mention are the Cabot Circus Shopping Centre whose modern design and eye-catching dome roof make it a favourite with Bristol instagrammers, as well as the beautiful Ashton Court mansion house and estate. Well, it looks like the citizens of Belfast aren’t afraid, come rain or sun, of a little hike up the mountain: Cave Hill took the top spot as the most instagrammed location in Belfast. Belfastians snapped and posted photos of their city as well as the Isle of Man and Scotland, which you can see on a clear day, more than any other location in Belfast. An honorable mention is due to Titanic Belfast: a significant number of photos of the visitor centre and famous monument, with its striking angular form, a design reminiscent of the prow of the eponymous ship which launched from the nearby dock, have been posted to Instagram. Edinburgh Castle won the first place as the most instagrammed location in Edinburgh by a long shot. A favourite with tourists, the fortress perched on Castle Rock, which is visible from much of the old city, is a prime candidate for a beautiful snap during the day or night, when it is lit up. In second place, and a short hop from from Edinburgh Castle, is Arthur’s Seat. The 250 metre peak provides panoramic views of the city and is a favourite with local photographers and tourists alike. In third place came the 83-acre Edinburgh Zoo, home of Sir Nils Olav, the world renowned penguin knighted in 2008 by the king of Norway, King Harald V.
Cardiff Bay took the top spot as the most instagrammed location in the city by a sizeable margin. The regenerated former docklands area with its restaurants, cafes and attractions like the Cardiff Bay barrage and the Cardiff Bay Wetlands Reserve has become a favourite of locals and tourists alike. In second place is the national stadium of Wales, the Millenium Stadium, and in third is beautiful, leafy Bute Park. We also crunched some numbers to figure out the popularity of the social network in the UK’s biggest cities. The first graphic represents the most photogenic cities in the UK. It measures the number of photos published with the city’s hashtag divided by the city’s population. As you can see, the cities of Manchester and Liverpool are punching way above their respective weights. We believe this is mostly attributed to the cities two imposing football clubs, which have legions of fans all over the globe. The next graphic ranks the most active Instagram communities in the UK. IG aficionados use #igerslondon (Instagrammers London), #igersliverpool (Instagrammers Liverpool), to publicly voice their belonging to that community. It’s a three horse race at the top, with Edinburgh having the most active Instagram community in the UK! The Scottish capital was closely followed by Bristol and London. How many of these British landmarks have you seen in person? If you plan on doing a British road trip, why not take the bus? The bus is a safe, affordable and reliable traveling option in the UK! So whether you enjoy going to football matches, visiting historical landmarks or casually chilling in a beautiful park, there’s always an amazing location to snap some photos! Using the location type and name of the popular locations on TripAdvisor across the UK, we looked at which locations produced the most hashtags for Instagram posts and ranked them. Feel free to use the assets found on this page freely. When using anything here, we ask that you link back to this page so that readers can explore other parts of the project and methodology as well. The Most Important Bus Features: What Are They and What Would You Pay?